Kong Kong and Ah Mah came last week. Thatday, early in the morning after bath I started to "korek" $$. They love to eat Dim Sum. Wanted to bring them somewhere nice for Dim Sum. It was a week day. 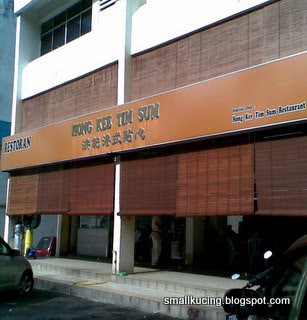 We decided to bring them to Hong Kee Tim Sum at Damansara Jaya. We have been to this shop two or three times. Their Dim Sum were good. Hmm...week days not many people but also means not much choice of Dim Sum too. 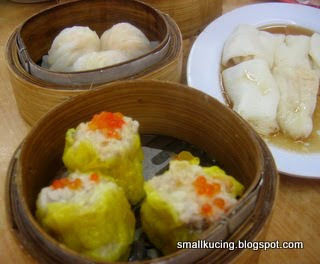 In fact they only steam the Dim Sum after the customer choose what they wanted. Hmm...which one shall I "attack" first? Chicken feet. 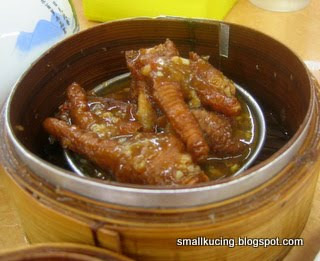 I didn't get to eat this coz Mamarazzi said if eat Chicken Feet, my writing will be like Cakar Ayam. mamarazzi ate a lot of chicken feet when she was young. Thus her writting can only be read by Doctors. 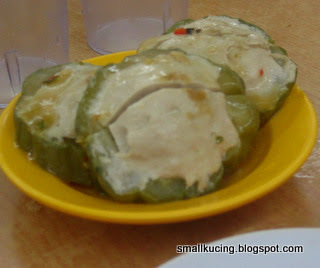 Stuffed Bitter gourd. Not nice. They are supposed to reheat the thing but when it came, it was still cold. Ah Mah finished it coz she said cincai la. No need to trouble them. Doesn't taste good. Wu Kok. 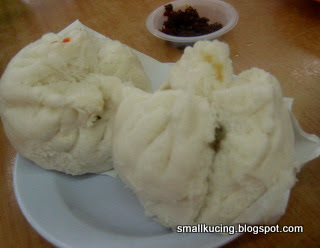 Ah Mah and Kong Kong's favourite. They tasted these and said not good. Chin Toi. Looks nicer than its taste. Not crunchy enough and too sweet. Prawn Hong kong Chi Cheong Fun. Hmmm..ordinary. Steamed pork rib. Ok-ok la. The chili not too spicy. 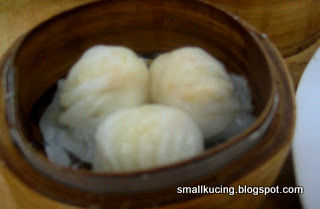 *Pouting* why la the quality of the Dim Sum dropped so much on week days? Wanted to treat Ah Mah and Kong Kong to a nice Dim Sum also tak boleh. Aiks...something new there. Maybe there is a redeeming grace after all. Chicken Lai. It seems that this shop have added Chicken Rice and Wan Tan Mee into their menu. Mamarazzi thus ordered a plate of Roast Pork and BBQ Pork (Portion for 2 person) and a plate of rice. Alamak! Mamarazzi forgot to tell them to give us half fat and lean meat. The man gave Roast Pork with a lot of fat. Overall taste? Both tasted not bad. Next time must remind Mamarazzi to request for meat with not too much fat. As for the rice? 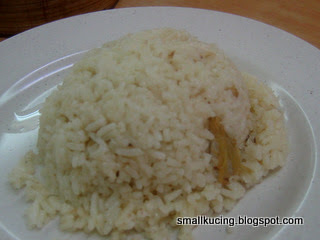 I finish half a plate of this rice while Ah Mah and Kong Kong shared the balance as they are quite full already. 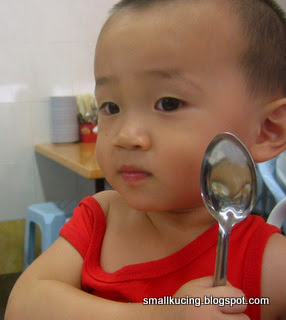 i heard Ah Mah remarked that too much ginger in the rice. 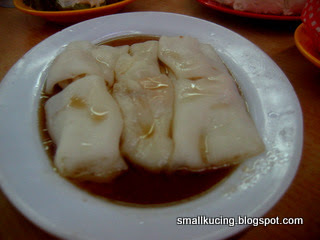 Conclusion...must come for Dim Sum during weekends instead of week days. 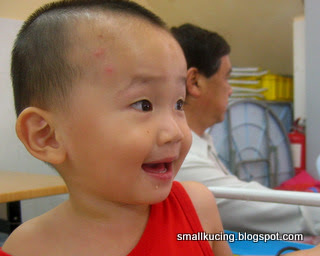 Yea..weekend has more choices while weekdays like pak wu ying..heheh. 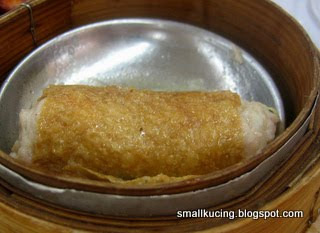 but ok i still see the dim sum looks great and yummy too..
mmmm, interesting, next time must make sure go there on weekends! I love chicky feet too... yum :-) That roast pork looks good too. Aik..week days not many customer and the quality drop? Btw, your nuff nuff did not appear. 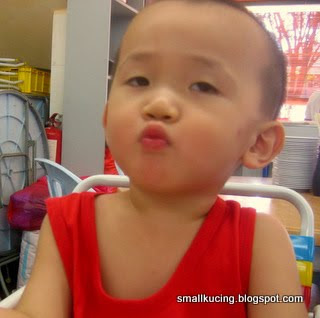 Wah, Joshua young young already got money to belanja Grandparents ah? Good GRandson! Hey betul ke? Eating chicken feet next time writing will be cakar ayam? So is that means I should not let Lynn to eat too? Alamak! Hey...I saw little spots on smallkucing's head. =.= nyamuk gigitkah? 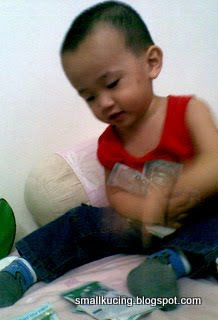 So kesian... come, auntie whack those nyamuk for you! wah...... so many dim sums!! You sure u guys can finished it? 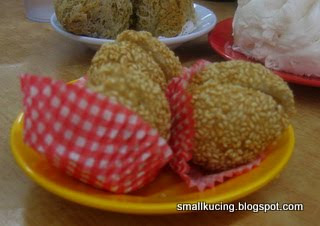 I think most dimsum place have more choices during weekend. 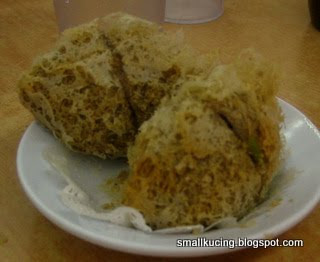 Hmm....as for this Hong Kee, am rather disappointed coz when we were there, they only heat up the dimsum when required loh. This by is getting "money faced" la. Many meh? no problem in finishing it all. There were 4 adults and me who was very hungry leh. His blood must have tasted like Ribena. That's why mozzie loves to bite him. =( Eii... I heard there's some sort of plant that can halau mozzies away...maybe, you can go to the florist, and check it out?